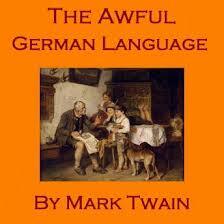 I enjoyed reading this, it took me back to my failed tryst with learning basic German in 3 months some years back. I’d imagine the ‘engineer’ types learn the ropes pretty quickly but probably end up forgetting the language quicker if they fall out of practice (since it’s a set of rules that they’ve memorized) than the ‘Van Goghs’ (who ‘feel’ the language while trying to learn it). I’ve heard “das ist mir Wurst”–it’s sausage to me. . .which I always think should mean, I don’t understand…but I think it means I don’t care. But other pork idioms, I don’t know. You’ll have to educate me! Also, I’m pretty sure that if you know your way around some good pork idioms, the rest of your language skills are excused! But in our hearts, it will always be the Rat-house! The sense of astonishment at the clarity when one puts on new glasses. New word to me–I’ll have to look it up! I know zero German, but one of the things I love about wrestling with a new language is what you describe about the far-seer–hearing the literal meanings of the words, which somehow become (at least in my mind) figurative, in all their bizarre, lovely specificity. All things we’ve learned not to hear in our own language. Agreed! And then you turn back to your native tongue and you hear it anew. That’s its own gift.